The protein, NKX3-1, has previously been shown to play a role in prostate development and tumor suppression. It can substitute for one of the four proteins first identified in 2007 by stem cell researcher Shinya Yamanaka, MD, Ph.D., as sufficient to prod mature cells like those in the skin or blood to become iPS cells—a transformation known in the stem cell world as reprogramming. The discovery creates a peephole into the black box of cellular reprogramming and may lead to new ways to generate iPS cells in the laboratory. It was made possible by the use of a unique laboratory model for reprogramming that tightly synchronizes the earliest steps of the process. "This is a crucial regulator that would not have been discovered any other way," said Helen Blau, Ph.D., professor of microbiology and immunology. "It appears within two hours of the initiation of reprogramming, and then it's gone. But it's absolutely critical. If we eliminate it, reprogramming doesn't happen." Blau, the Donald E. and Delia B. Baxter Foundation Professor and director of the Baxter Foundation Laboratory for Stem Cell Biology, is the senior author of the research, which was published online July 16 in Nature Cell Biology. Postdoctoral scholar Thach Mai, Ph.D., is the lead author. The ability to reprogram mature cell types, such as skin cells, into pluripotent stem cells by the addition of just four proteins, called Yamanaka factors, captivated the scientific world and led to a Nobel Prize in 2012 for Yamanaka. Since then, countless researchers worldwide have used the technique to create iPS cells for study or potential clinical use. The four Yamanaka factors—Oct4, Sox2, cMyc and Klf4—were identified because they are highly expressed in embryonic stem cells in mice and humans. Exposing mature cell types to these factors makes them regress in their development and, eventually, behave like stem cells, even beginning to express Oct4 on their own. There are concerns about this process, however, because cMyc and Oct4 are oncogenes that can cause cancers when overexpressed in normal cells. 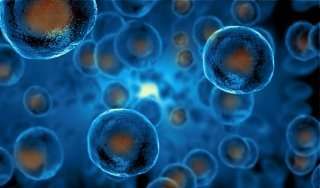 Researchers believe an understanding of how reprogramming occurs might allow them to identify new ways to generate stem cells that are safer for clinical use. Unfortunately, much of what goes on during the first hours of reprograming has remained a mystery, in part because only about 1 in 1,000 cells treated with the factors successfully undergoes the transition. Furthermore, those that do, do so on their own erratic schedule. "It's been difficult to get a handle on early regulators of reprogramming to pluripotency," Blau said. "The process is highly heterogeneous and asynchronous, so the earliest events have been hard to study." To overcome this limitation, Mai turned to a cell fusion model used successfully by Blau in the 1980s to show that specialized human cells, such as those in the liver and skin, could express muscle-specific genes when joined with mouse muscle fibers. At the time, the results provided the first evidence that adult cells could be coaxed under the right conditions to assume entirely different cell fates. In the new study, Mai fused human skin cells called fibroblasts to mouse embryonic stem cells. After fusion, factors in the developmentally flexible stem cell quickly and efficiently reprogrammed the fibroblast nucleus along a predictable, research-amenable timeline. The fused cells are called heterokaryons, and they enabled Mai and his colleagues to closely track patterns of gene expression and DNA modification during the first 24 hours of reprogramming. Using the heterokaryon model, the researchers discovered that NKX3-1 is expressed within about two hours of the initiation of reprogramming but quickly dissipates. If the protein's expression is blocked, the Yamanaka factors are no longer able to reprogram the human fibroblasts, indicating NKX3-1's crucial role in the conversion of adult cells to stem cells. The researchers also found that externally added NKX3-1 can replace Oct4 to reprogram cells without any loss of efficiency. Finally, they also showed that NKX3-1 expression was necessary to trigger the cells' expression of their own Oct4 protein and to promote other genetic changes that facilitate reprogramming. Now Blau and her colleagues, in collaboration with assistant professor of genetics and of computer science Anshul Kundaje, Ph.D., plan to continue their studies into the earliest steps of reprogramming to pluripotency using a multipronged "omics-based" approach. "Our goal is to study all facets of the regulatory logic, or 'grammar,' that underlies cellular reprogramming to pluripotency," Blau said. "Reprogramming completely changes a cell's fate. We want to understand the mechanistic and signaling pathways that mediate such a remarkable change."